On the world called Hyperion, beyond the law of the Hegemony of Man, there waits the creature called the Shrike. There are those who worship it. There are those who fear it. And there are those who have vowed to destroy it. In the Valley of the Time Tombs, where huge, brooding structures move backward through time, the Shrike waits for them all. On the eve of Armageddon, with the entire galaxy at war, seven pilgrims set forth on a final voyage to Hyperion seeking the answers to the unsolved riddles of their lives. Each carries a desperate hope--­and a terrible secret. And one may hold the fate of humanity in his hands. "A literary thriller like no other...­A hard-­charging, edge-­of-­the-­seat tale.­" -­Milwaukee Journal Sentinel Darwin Minor travels a dangerous road. A Vietnam veteran turned reluctant expert on interpreting the wreckage of fatal accidents, Darwin uses science and instinct to unravel the real causes of unnatural disasters. He is very, very good at his job. His latest case promises to be his most challenging yet. A spate of seemingly random high-­speed car accidents has struck the highways of southern California. Each seems to have been staged-­yet the participants have all died. Why would anyone commit fraud at the cost of his own life? The deeper Darwin digs, the closer he comes to unmasking an international network specializing in intimidation and murder, whose members will do anything to make sure Darwin soon suffers a deadly accident of his own. Series : Book 2 of "Hyperion"
In the stunning continuation of the epic adventure begun in “Hyperion”, Simmons returns us to a far future resplendent with drama and invention. On the world of Hyperion, the mysterious Time Tombs are opening. And the secrets they contain mean that nothing—nothing anywhere in the universe—will ever be the same. Taking the events and characters of the Iliad as his jumping off point Dan Simmons has created an epic of time travel and savage warfare. Travellers from 40,­000 years in the future return to Homer's Greece and rewrite history forever, their technology impacting on the population in agodlike fashion. This is broad scope space opera rich in classical and literary allusion from one of the key figures in 1990s world SF and marks a return to the genre for one of its greats. The men on board Her Britannic Majesty's Ships Terror and Erebus had every expectation of triumph. They were part of Sir John Franklin's 1845 expedition - as scientifically advanced an enterprise as had ever set forth - and theirs were the first steam-­driven vessels to go in search of the fabled North-­West Passage. But the ships have now been trapped in the Arctic ice for nearly two years. Coal and provisions are running low. Yet the real threat isn't the constantly shifting landscape of white or the flesh-­numbing temperatures, dwindling supplies or the vessels being slowly crushed by the unyielding grip of the frozen ocean. No, the real threat is far more terrifying. There is something out there that haunts the frigid darkness, which stalks the ships, snatching one man at a time - mutilating, devouring. A nameless thing, at once nowhere and everywhere, this terror has become the expedition's nemesis. When Franklin meets a terrible death, it falls to Captain Francis Crozier of . . . When Song of Kali was published in 1985, Dan Simmons was virtually unknown, having published only a few short stories. But this sharp, vivid novel struck a raw nerve. A startled and amazed readership could only gasp in wonder and horror at the apparent ease with which the author made readers feel that they were living the nightmarish reality he so potently conveyed in the pages of this blood-­curdling novel. Here is Calcutta, perhaps the foulest and most crime-­ridden city in the world: filthy, stench-­ridden, crawling with vermin both human and otherwise, possessed of evils so vile that they beggar description. In this steaming, fetid cradle of chaos, the ordeal of an American man and his family plays out, moment by moment, page by page, in a novel so truly frightening that otherwise jaded readers will quail in fear at its gut-­wrenching finale. One of the great masterpieces of horror of this century, Song of Kali will leave an indelible . . .
Series : Book 3 of "Hyperion Cantos"
Series : Book 4 of "Hyperion Cantos"
Hyperion --­with a novel even more magnificent than its predecessors. Dan Simmons's Hyperion was an immediate sensation on its first publication in 1989. This staggering multifaceted tale of the far future heralded the conquest of the science fiction field by a man who had already won the World Fantasy Award for his first novel ( Song of Kali ) and had also published one of the most well-­received horror novels in the field, Carrion Comfort . Hyperion went on to win the Hugo Award as Best Novel, and it and its companion volume, The Fall of Hyperion , took their rightful places in the science fiction pantheon of new classics. Now, six years later, Simmons returns to this richly imagined world of technological achievement, excitement, wonder and fear. 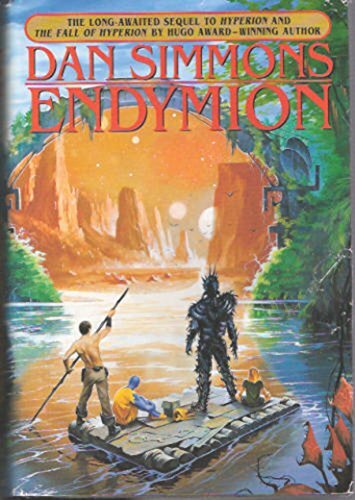 Endymion is a story about love and memory, triumph and terror--­an instant candidate for . . .